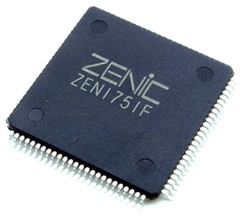 The ZEN1751F is a GPIO LSI that combines functions commonly used in video equipment and FA equipment into one chip. The installed I / O is a general purpose input / output port, I2C bus master, SPI port, PWM output, infrared remote control input, UART, pulse counter. Since each block can be individually shifted to the standby mode, a low power consumption system can be realized. In order to flexibly deal with various operation rate demands of each peripheral, each block can select the operation clock from two kinds of clock sources (however, general-purpose I / O and I2C block are exclusively for SCLK). * I2C is a trademark of Philips Corporation. For inquiries about purchasing FV unit products / FVIP products / IC products, please confirm purchase information.